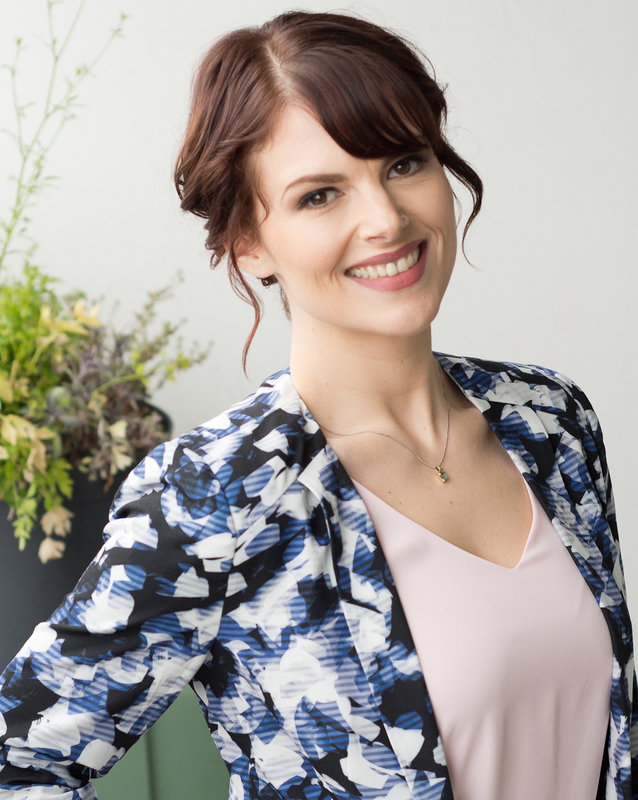 Roasted Cauliflower with Dipping Sauce – Erika Brown R.D. 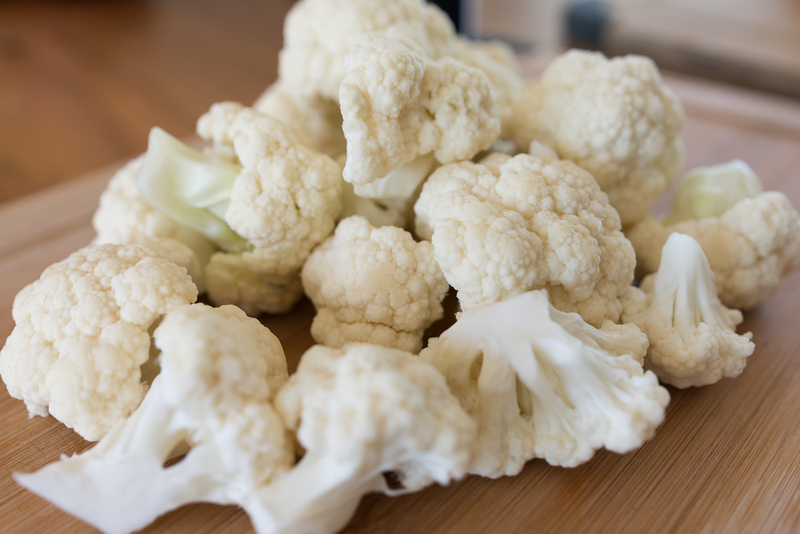 On its own, cauliflower can seem a little uninspiring. But roasted cauliflower is a whole other story. 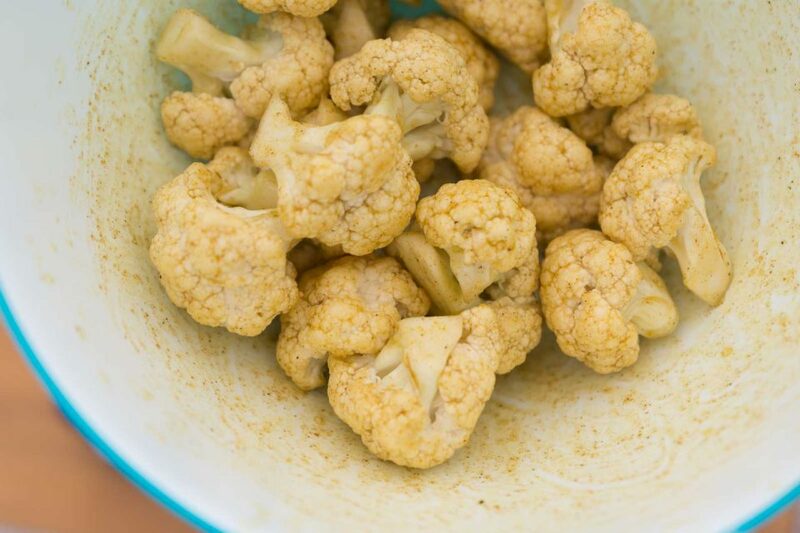 Once the edges start to brown and the sugars start to caramelize, a crumbly head of cauliflower transforms into a snack so satisfying you’ll completely forget you’re eating vegetables. Cauliflower is one of those versatile veggies that will soak up any flavour. So if you don’t love the taste of curry, feel free to swap in any of your favourite spices (smoked paprika is another favourite of mine). Also, using one or more coloured cauliflower adds a delightful splash of colour to this flavourful dish. The truth is, roasting cauliflower is so simple that after you’ve done it once or twice it doesn’t actually need a recipe. 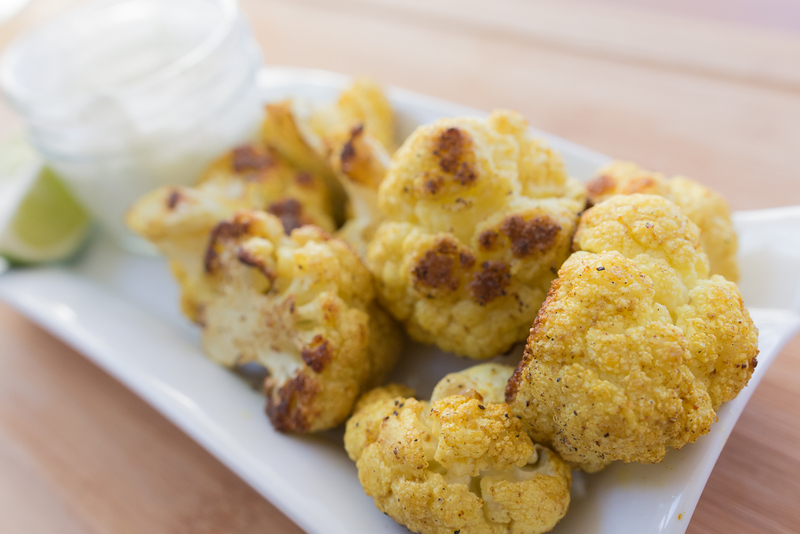 Just follow the four simple steps below and you’ll be a cauliflower convert in no time! Step 2: Whisk together oil and spices, add florets and toss to coat. Step 3: Roast in 400°F oven, stirring once, for 30 – 40 minutes. Looking for a way to spice up your cauliflower? 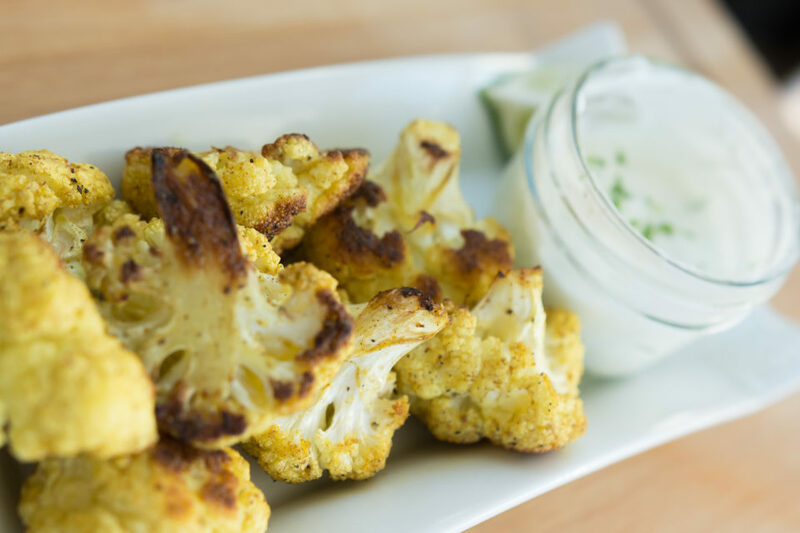 Try this Roasted Curry Cauliflower with Dipping Sauce! Spicy cauliflower caramelized to perfection then dipped in tangy sauce makes this a highly addictive dish. Plus, with two servings of vegetables and a protein packed dipping sauce, this filling snack will leave you perfectly satisfied. Preheat the oven to 400°F (200°C). Line a baking sheet parchment paper. Remove leaves and stalk from cauliflower head and then break up the cauliflower into evenly sized florets. In a large bowl, whisk together olive oil and spices to taste. Add the florets and gently toss to coat. Using a basting brush, coat the cauliflower with the remaining sauce. Pour on prepared baking sheet and roast until tender and slightly browned, 30 to 40 minutes, tossing halfway through. Meanwhile, in a small bowl, combine the yogurt with the lime zest, salt, pepper, and a squeeze of lime (to taste). Serve the cauliflower immediately with dipping sauce. For a non-dairy dipping sauce try this three ingredient tahini sauce from Minimalist Baker. 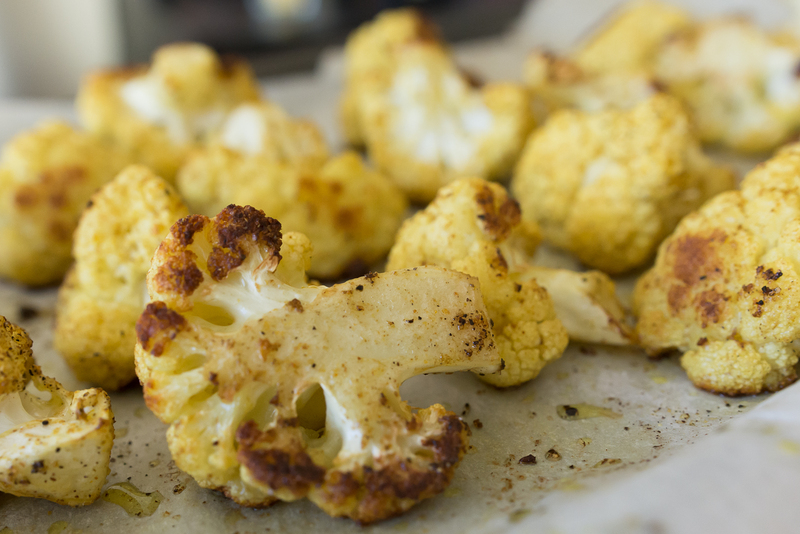 This sauce goes perfect with roasted cauliflower just the way it is, but you can make it your own by adding maple syrup, minced garlic, pepper, turmeric, cayenne or any of your other favourite flavours.